Monday, I won not just one but TWO awards! Wow! 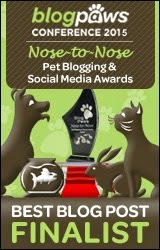 Very excited about this as they are my first blog award badges ever! And they are from some very cool hamster blogs! The first award came from Willow the Hamster and Hannah at Animal Tails. 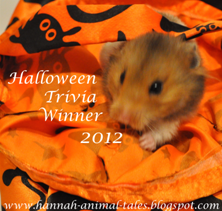 Animal Tails is a Hamster blog and the star of the show is Willow. I won their Halloween Trivia Contest. Willow is so adorable! Look for yourself, she's featured on my super cute badge. If you haven't visited Animal Tails, you definitely should. Hannah and Willow are very nice! Here's my awesome award featuring Willow the Hamster! 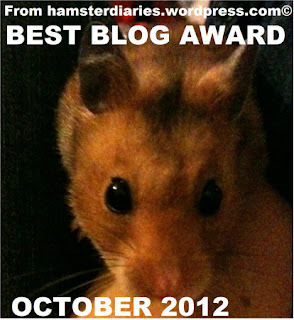 My second award comes from Casper, Dexter, Eve, and their mommy from Hamster Diaries. 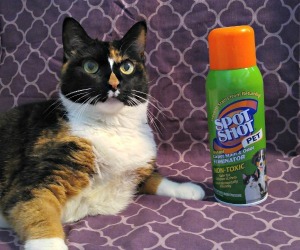 They chose me as their favorite blog for the month of October 2012! What an honor, I'm so grateful. You should stop by the Hamster Diaries blog today to see what these three little hammies are up to. My amazing award from Casper, Dexter, and Eve at Hamster Diaries. Thanks so much my new little friends! Hi there, just popped over from Hamster Diaries to say a BIG HELLO to you. Congrats on winning their Best Blog Award! Congratulations! Awards are fun, and you have won a couple of really pretty ones! Congratulations!!!! Soon, they will start to get on your nerves..........if people were being honest they would admit that! hehehe!! Two awards in one day! And your first ones ever too! That's very exciting :D Congratulations!! Con-cats on your great awards!!! Congratz on the cool awards, Ann!!! 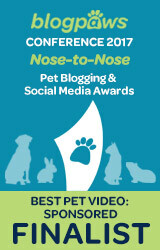 Concatulations on such pawsome awards! !